Power rates are high and continue to rise. Photovoltaic generates clean and renewable power for your property at minimal cost. Save money now and lock in reduced rates with a system that lasts for 25 years! Solaron is an experienced solar contractor, and we only use SunPower solar panels, guaranteed for 25 years of life. This makes for a winning solar combination for of our clients in Brentwood. Another argument for solar is that we live in one of the brightest states in the Union. 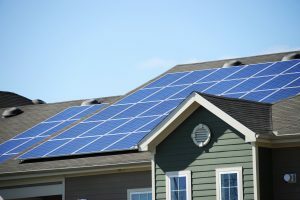 And if you examine the statistics for California and Brentwood, even during the winter, you can depend on a number of sunny days when your solar panels continue to generate electricity. This benefits, not only your bottom line, but also the future of our planet. The less power you use from the grid, the less carbon that you put into the atmosphere. So solar power has a positive effect on the future and it begins from the moment you turn it on. Since both governments and municipalities see advantages of customers adding solar panels to their properties, various incentives are available that considerably slash the installation costs. Our Solaron sales representatives are familiar with these programs and in what areas they apply. So call Solaron today to find out how you can save money both before and after your solar installation, while simultaneously doing your part for the future.